Welcome to the Spanish restaurants in Barcelona guide, where you will find information on a selection of ten of the top Spanish restaurants around the city. You will be able to choose from the most traditional dishes to a more modern approach style of cooking. Barcelona is the capital of the Spanish region of Catalonia and can be found in the North-East of Spain. The city of Barcelona is famous for its wild architecture courtesy of Antoni Gaudí and other Catalan Modernist Spanish architects. The beaches, the port and the mountains are some of the trademarks of the city of Barcelona and are just a few of the elements that attracts tourist to visit Barcelona. The city is considered to be one of the European capitals of gastronomy and as a result has a large selection of Spanish restaurants. 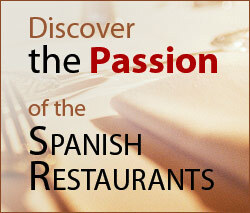 You can find restaurants in Barcelona with cuisine from all over the world as well as traditional Spanish food. There is also a mixture between traditional style restaurants and super modern restaurants. However the focus is always on good food! Below is a list of the best Spanish restaurants in Barcelona. You can consult further details on each of them by clicking on their individual pages. The Restaurant Casa Calvet is a Spanish restaurant in Barcelona which gives you the opportunity to experience the famous architecture of Antoni Gaudí first hand as it is housed in the magnificent Calvet House which he created for a Catalan man of industry. El Dento is a modern, luxury Spanish restaurant in Barcelona which has recently been redesigned in order to be a much more unique and chic establishment. El Dento provides some of the best quality dishes using the highest quality ingredients which they source from across the world. Els Quatre Gats is a historic Spanish restaurant in Barcelona which was created to mimic the famous friendly atmosphere that the founder enjoyed so much at Le Chat Noir cabaret in Paris. Today this is a great restaurant to visit for some tasty Spanish food and a dip into Catalan history. La Font de Prades is a Spanish restaurant in Barcelona which can be found in the Poble Espanyol museum on the Montjuïc mountain. Surrounded by the fantastic buildings of this large, open-air museum, La Font de Prades produces some of the best Catalan dishes in the city. The Mayura Lounge is a Spanish restaurant in Barcelona and is a great example of the diversity in the cuisine to be found in the city. This restaurant specialises in providing the best Indian dishes in a truly, authentic Indian setting. It could also be a welcome break for some tourists who are fed up of Spanish food! The Restaurante ABaC is a Spanish restaurant in Barcelona which forms part of the ABaC Hotel in Barcelona. The restaurant is particularly famous in the city and has so far been rewarded with two Michelin stars for its Catalan cuisine. The Restaurante Arenal is a Spanish restaurant in Barcelona which likes to showcase the best that the Catalan land and coastline has to offer. Thanks to its wonderful position by the sea and its terrace which sits directly on the sand of the beach, this restaurant in Barcelona is a must-visit for all lovers of the city of Barcelona. The Restaurante Dos Cielos is run by two brothers who have created an innovative Spanish restaurant in the city of Barcelona. The Dos Cielos restaurant focuses on the overall experience of food and they have created their own science to help them explain their dishes more accurately rather than just simply listing the ingredients. The Restaurante Parrilla la Santa is a Spanish restaurant in Barcelona whose focus is on art as well as good Argentinean food. The establishment is full of original artworks by the owner which creates an interesting space in which to enjoy a tasty meal. The Restaurant Set Portes is a historic Spanish restaurant in Barcelona which is famous, as its name dictates, for its seven large doors. This is the place to go to enjoy some Mediterranean and Catalan cuisine whilst being surrounded by a bit of Catalan history.